GenTORE – “GENomic management Tools to Optimize Resilience and Efficiency” is a H2020 project that aims to develop innovative genome-enabled selection and management tools to optimize cattle resilience and efficiency (R&E) in widely varying and changing environments. The need for resilient production systems is clear and increasingly urgent, and such systems include resilient animals (Dumont et al., 2014). In the context of livestock systems, the optimal trade-off between resilience and efficiency will differ according to the local production environment, i.e. tailored solutions to optimizing resilience and efficiency are needed. A methodological improvement of the genomic analysis allowing the development of genomic predictions for R&E across (small) cattle breeds and their crosses by using imputed sequence data on the largest genomic database of beef and dairy cattle globally. New proxies that allow measures for commercial on-farm phenotyping and associated data analytic tools, subsequently providing phenotypes necessary for developing genomic predictions and an on-farm management index for cow R&E. New metrics to measure local production environments (including environmental, economic and social aspects) that allow inclusion of genotype-by-environment interactions in genomic predictions. An on-farm management index, combining genomic information with phenotypic measures, which provides insight in the trade-offs and synergies between R&E, thereby ranking cows on their expected resilience and performance. This will allow farmers to actively adjust R&E for their farm system and evaluate the consequences of not doing so. All tools will be developed in collaboration with stakeholders and subsequently tested on farms within several stakeholder networks. These stakeholders represent farm managers, the breeding industry, farm technology developers, veterinary services, farm system advisors and scientists. By providing these tools, GenTORE delivers impacts from the farm level, enhancing innovation capacity through applied breeding technologies and management support tools, and thereby creating new market opportunities. The combined research and outreach program of GenTORE will make a significant contribution to addressing the challenges facing farming in a changing and volatile world. GenTORE embraces a multi-actor approach as half of the Consortium members consists of non-academic institutions e.g. breeding associations, trans-national organizations, farm management and veterinary advisory services and farm technology companies. It’s a five-year European project that is organized around 8 work packages with: 6 research work packages (WP), 1 outreach, dissemination and training WP and 1 management WP (see figure 1). Figure 1. Work Packages in GenTORE project. The above structure enables the assembly of research results into operational tools, considering what is needed for a multi-trait selection index (WP4 and 5), namely trait values (WP3), relative weights (WP1), and co-variance between traits across life stages (WP2). 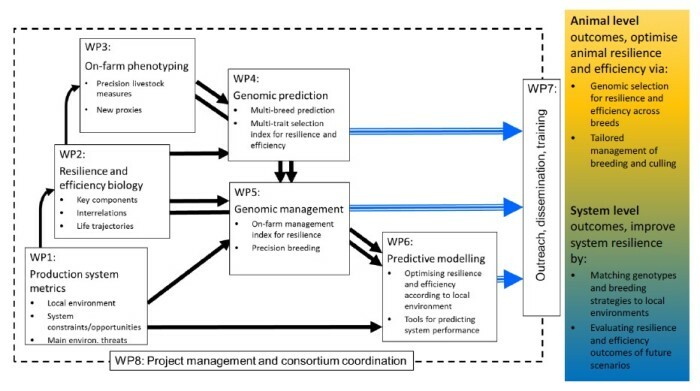 WP6 deals with developing predictive modelling tools for future selection and management strategies, including assessment of the impacts of climate changes. 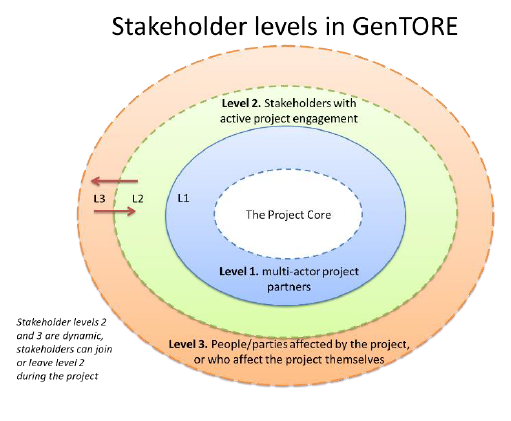 WP7 involves all stakeholders in the project, this includes the stakeholders who will directly engage with GenTORE from the start, but also a broader network of stakeholders who are targets for dissemination. As mentioned above, GenTORE will count on a broad and diverse network of stakeholders in WP7. Figure 2 provides an overview of the stakeholder engagement and inclusion. Figure 2. Overview of stakeholders. Stakeholder level 3: stakeholders who will be the final users of the project results (both policy makers and the relevant media). Stakeholders in level 1 and 2 will profit from working together towards a more resilient and efficient beef and dairy cattle production sector. The stakeholders will be involved from the start of the GenTORE project. This will benefit the quality and applicability of the project outcomes. Furthermore, diversity within the stakeholders will lead to more ideas and perspectives, ensuring an approach with greater depth and breadth to sustainably improve resilience and efficiency in cattle. The outcomes of GenTORE will be more relevant to what is happening in daily practice on beef and dairy farms but should also be more user-friendly and adopted rapidly and seamlessly by stakeholders.